2.We will add the tokens to your machine within 12 hours and will inform you. When you use VVDI MB BGA Tool to calculate password for BENZ vehicle, you need use 1 token for once calculate. If you order the SK185-S, For customers who have ( SL273 Original iKeycutter CONDOR XC-MINI and SL355 Ikeycutter XC002), you can get a free calculate token everyday. For customers do not have Ikeycutter machine, you must buy tokens from us (1 token for once calculate). Support calculate password for NEC v51, v57 keys. No soldering, safe method. 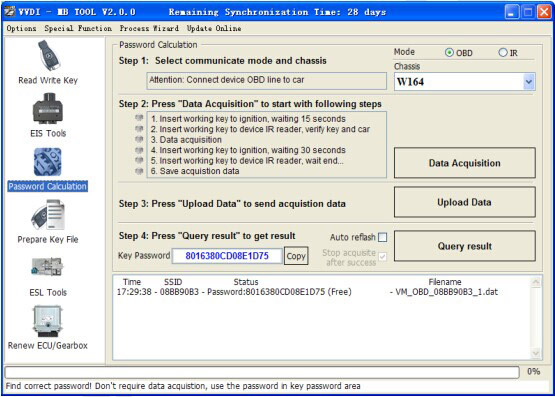 Upload Data: Upload saved acquisition data to server for calculate password. How to see the tokens?